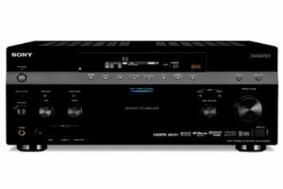 IFA NEWS: Sony boosts its ES range with two new AV receivers | What Hi-Fi? Completing the package is the company's onscreen Quick Click virtual remote control for connected components, and two Digital Media Ports for iPods, Sony Walkman players, Sony Ericsson phones and Bluetooth devices. The lower-priced STR-DA3500ES has four HDMI inputs, loses the network connectivity and Quick Click remote, and has just one DMPort. Both receivers go on sale next month, at prices to be announced. Also new is the wireless-ready STR-DN1000 receiver, which we first covered in our report of Sony's US trade show back in March. This 'designer' model, with its piano black finish, sits above the existing STR-DH800, and has four HDMI inputs, upscaling and upconversion from all analogue video inputs, decoding for all the HD audio formats and a 7x110W output. There's also wireless multiroom capability built-in, with the addition of an optional transmitter and wireless active speakers. The transmission system is Sony's own S-AIR, and it can drive up to ten remote zones around the home up to a maximum range of 50m. In addition there's an icon-driven menu system, and connectivity for portable devices and home networks using the DM Port system.